On temporary loan from the Mt. 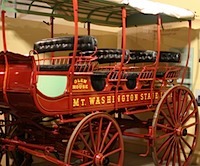 Washington Auto Road, this beautifully restored Abbot-Downing Mountain Wagon has taken its place alongside our own Concord Coach in the Transportation Building Museum. When the Mt. Washington Carriage Road opened in 1861, its operators needed a new kind of conveyance for tourists traveling to New England’s highest peak. The Abbot-Downing Company of Concord (NH), makers of the famous Concord Coach, developed a new, lightweight design for a 12-passenger vehicle sturdy enough to run safely in such a harsh environment. leather brake pads on each wagon had to be replaced after every trip! During the heyday of the Glen House, the hotel at the base of the Carriage Road, a dozen mountain wagons were in service. They were replaced by automobiles in 1913.